Choose all the variations from drop-down menu envelopes, pack of... We can provide a form to put all details in. We will prepare the digital preview within 5 days. After receiving the preview/draft you have a chance to make any changes you need as many times as needed until you are 100% happy. After acceptance we will print your order. Samples are intended to give an idea of the print quality, size etc. 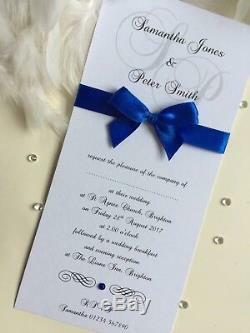 They are not personalised with your own text however they can be requested in a specific colours, embellishment and font. After completing the checkout please provide your choices of. 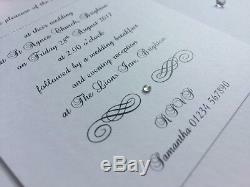 Rhinestones (pearls or diamantes) font style. 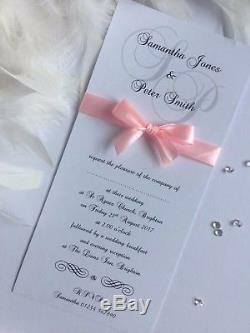 Heavyweight, best quality card in white and ivory (300 gsm). Laser printing - we do all the printing for you (no inkjet printing or hand cut finishing). Your initials on the background. Over 50 different fonts (possibility of mixing different fonts). 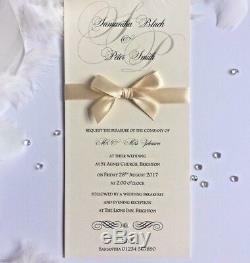 Over 40 satin and 25 organza ribbon colours or your own ribbon. Diamante (8 colours) or pearls. Size DL (9.9cm x 21cm). 5 day and 5 evening wording templates to choose from or send your own wording. 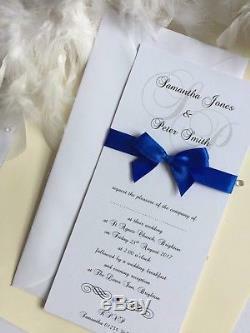 ON HOLD option (we will keep your stationery until you know all details - longest we did was just over 2 years). Extra 5% DISCOUNT on bulk orders. If you're looking for something specific that you can't find in our shop please send us a message. We can fully adapt the item to your requirements and we will be happy to answer any questions regarding the design. Your satisfaction is very important to us and we will try to solve the problem immediately if possible. 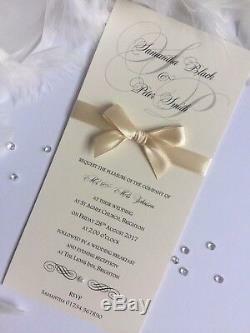 (white, ivory, champagne, latte, cappuccino, silver, charcoal, black, yellow, sunflower, daffodil, honey gold, gold, pecan brown, chocolate, apricot, peach, coral, orange, burnt orange, red, burgundy, wine, powder / blush pink, baby pink, bubble-gum, dusky pink, orchid, shocking pink, cerise, fuchsia, lilac, pale lilac, lavender, violet, plum, Cadbury purple, magenta, aqua, baby blue, sky blue, dusky blue, turquoise, teal, sapphire, royal blue, navy / midnight blue, mint, pistachio, bright green, apple green, olive, lime, sage, emerald, bottle green / forest green, tan). 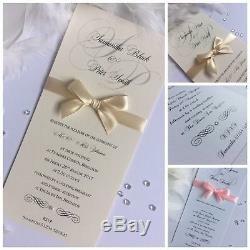 The item "Wedding/Evening Invitations INITIALS Tall Long Personalised Handmade Bow" is in sale since Sunday, October 1, 2017. 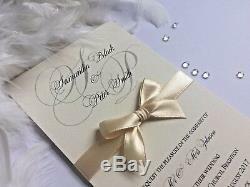 This item is in the category "Home, Furniture & DIY\Wedding Supplies\Cards & Invitations". The seller is "the_lavender_avenue" and is located in Eastbourne, East Sussex.